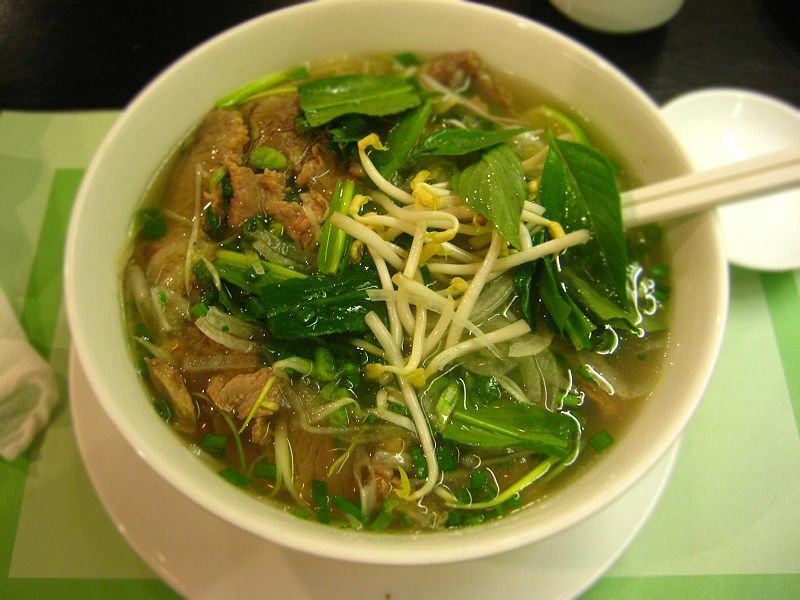 Pho is a Vietnamese beef and noodle soup. The soup includes noodles made from rice and is often served with basil, lime, bean sprouts and peppers that are added to the soup by the customer. Left: Vietnamese pho noodle soup, Saigon-Style. 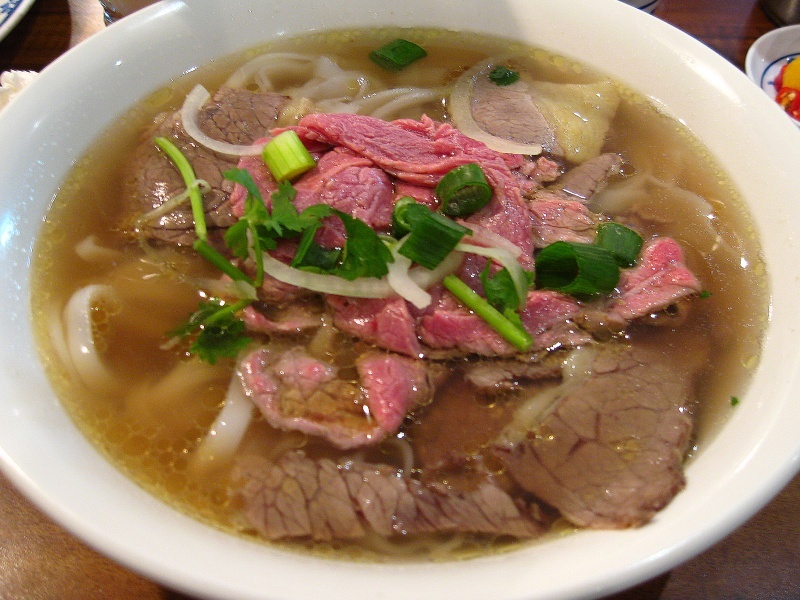 Pho is served in a bowl with white rice noodles in clear beef broth, with thin cuts of beef (steak, fatty flank, lean flank, brisket). Variations feature tendon, tripe, meatballs, chicken leg, chicken breast, or other chicken organs. The broth is generally made by simmering beef (and sometimes chicken) bones, oxtails, flank steak, charred onion, and spices, taking several hours to prepare. Seasonings can include Saigon cinnamon or other kinds of cinnamon as alternatives (may use stick or powder), star anise, roasted ginger, black cardamom, coriander seed, fennel seed and clove. Vietnamese dishes are meals typically served with lots of greens, herbs, vegetables and various other accompaniments such as dipping sauces, hot and spicy pastes, and flavor enhancements such as a squeeze of lime or lemon. 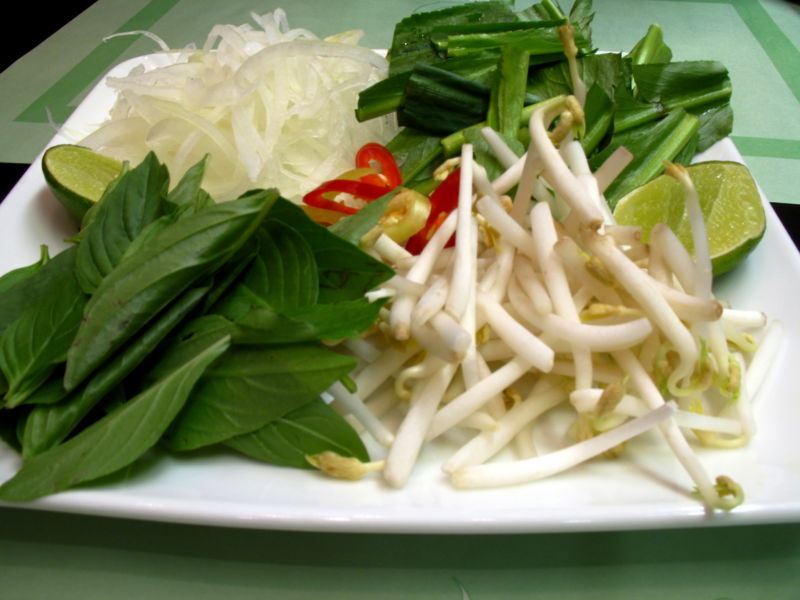 Left: Typical garnishes for pho: culantro, basil, lime, bean sprouts and onions. The dish is garnished with ingredients such as green onions, white onions, coriander, Thai basil, fresh Thai chili peppers, lemon or lime wedges, bean sprouts, and leaves of culantro (ngò gai) (should not be confused with cilantro or coriander - which is called ngò rí in Vietnamese. The coriander plant is used just for its seeds to prepare the broth, but not its leaves). Several ingredients do not come with pho but can be ordered by request. Extra beef fat in broth can be ordered and comes with scallions to sweeten it. A popular side dish ordered upon request is hanh dam, or vinegared white onions. Left: Vietnamese pho noodle soup with sliced rare beef and well done beef brisket.